Super Flip is a sleek online pokies game from leading software provider Play’n Go, taking a fresh approach to the classic slot format. This five-reel game features classic pokies symbols, with the addition of bonus features and the SuperFlip bonus game giving you the chance to turn the reels backwards to create bigger wins. Find out how and where to play this simple yet elegant pokies game for real money bets at the best casinos on the Web. Play’n Go pokies use Flash-based software, which means Super Flip is available for instant-play directly over your Web browser with no downloads required. Just head to any of our recommended Play’n Go casinos above to sign up for an account, claim your welcome bonus and make an instant deposit to start playing for real money. Super Flip is a five-reel, three-row game featuring 20 un-fixed paylines. To play, all you need to do is set the size of your wager using the buttons at the bottom of the reels, by selecting your coin value, number of coins and the number of paylines you wish to activate. Minimum bets start at $0.01 per cent, with maximum bets set at $100, making Super Flip suitable for casual punters as well as high rollers. An auto-play function also allows the computer to play up to 50 spins on your behalf. The maximum jackpot you can win in Super Flip is 1,000,000 coins, making it quite a profitable game if luck is on your side. Wild symbol – The purple wild symbol substitutes all other symbols to form a winning combination, except for the scatter symbol. Scatter symbol – The scatter is the pink and yellow SuperFlip symbol, which is responsible for triggering free spins and also pays in any position. SuperFlip free spins – Three or more of the SuperFlip symbols activates the SuperFlip bonus, awarding 15 free spins where the reels are flipped in reverse for the possibility of bigger wins. SuperFlip free spins can be re-triggered, allowing up to 90 free spins at once. Re-spins – When the first and second reels contain nothing but matching symbols, but no winning combination is formed, you’ll trigger a free re-spin on the middle reel for the chance to create a win. 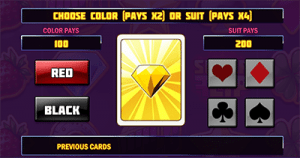 Gamble feature – Super Flip contains a classic gamble feature, which becomes available after any win. Here you have the chance to double or even quadrouple your win by correctly predicting the colour or suit of a face down card. To participate, click the ‘gamble’ button that becomes illuminated at the bottom of the reels. The gamble bet can provide a pretty big boost to your winnings, but make the wrong guess and you’ll lose it all. Slots Million – A site dedicated 100 per cent to the pokies, with over 1800 instant-play games available. House of Jack – Offers real money pokies from many of the best software proviers, including Play’n Go, Microgaming, BetSoft, and more. These trusted pokies venues also offer many other popular Play’n Go titles, including Gemix, Hugo, Grim Muerto, Pimped, Wild North, Fire Joker, Rich Wild and the Book of Dead, Tower Quest, Spin Party and many more. With so much variety when it comes to online pokies, it makes sense that most players usually go for games with the most interesting and unique themes and special features. However, every now and then it’s nice to take things down a notch and just enjoy a simple game that isn’t as concerned with the bells and whistles. 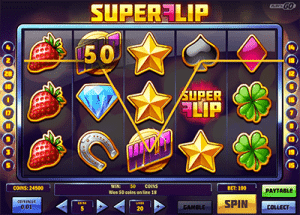 Super Flip is this kind of game, utilising a bold, bright design with classic slot symbols, while keeping up with the competition by adding plenty of bonus symbols and special features to keep players engaged. It’s a simple yet sophisticated game, and well worth a try.